One should be able to establish, in his mind, a distinction between the value of investments in operating mines and in prospective mines; and he should likewise be competent to fix some difference in his attitude when purchasing the stocks in these dissimilar projects. One should invest in an established mine with the same business precautions that would guide him in buying an interest in a mercantile establishment. It is possible to obtain, through competent engineers, the approximate present valuation and the probable life of any mine and thus to arrive at conservative figures that will govern one's investments. But, when debating the purchase of stock in a prospect, a man should learn all the available facts concerning the geology and the organizers and should then decide, in his own way, whether he cares to make the purchase. Even the prospects offering the finest inducements have been known to disappoint, just as some less promising prospects have occasionally exceeded expectations. So, while there are certain safeguards to investments, there should also be accepted the uncertainties which must accompany the placing of faith in unseen things. The same general rules for business success will attend both commercial and mining enterprises. Any incorporation must be handled according to recognized, successful methods, no matter what its scope or activity. In most lines of business, there is a likelihood of growth with longevity, there being no reason to limit the life of the usual mercantile business. With advancing years, a manufacturing company, for instance, with good management, will establish a reputation and will gradually increase its business and its stock in trade. But with a mine, the business is one which is most successful only when actually depleting the assets at the most rapid rate. With some kinds of mines such as coal, placer, iron or the "reef" gold mines of the Rand, the life can be very accurately forecast and all activities may be planned for specified periods. In some kinds of mining ground—as for instance, the irregular masses of Leadville or the crooked and uncertain veins of Tonopah—there can be no predictions that will reliably or even approximately decide the probable life of the mining activities of any company. The duration of mines of this second class is wholly problematical. A few years ago, there was much discussion of this subject and one writer, who had collected statistics over an extended period and covering various kinds of mines, arrived at the conclusion that the average life of a mine is about eleven years. J. P. Wallace, in his work, Ore Deposits for the Practical Miner, in discussing this point says, "The average mine, if continuously worked, seldom lasts longer than three to five years. A mine is valuable not for what it has produced, but for what it is capable of producing." This opinion cannot be borne out by facts, for the brevity he ascribes to the average mine is altogether unreasonable and his statement is pessimistic. The cases of mines which have petered out in three or five years are exceptionally few. It must be that the experiences of this author have been in "pockety" districts, for he could not have lived in any of the worthy mining camps of the world very long and have come away with any such notion. To take care of this intrinsic feature of mining, and to place propositions fairly before the public, there should be attention given to the matter of recovering the invested capital before the expiration of activities through the exhaustion of mining assets, the ore bodies. This practice, known as "amortization," is being given more and more consideration as people come to realize this peculiarity of mining. Some companies are now so organized and managed that there is a guaranteed refund, at stated periods, or whenever profits have accrued, of fractions of the invested capital with accumulated interest thereon. 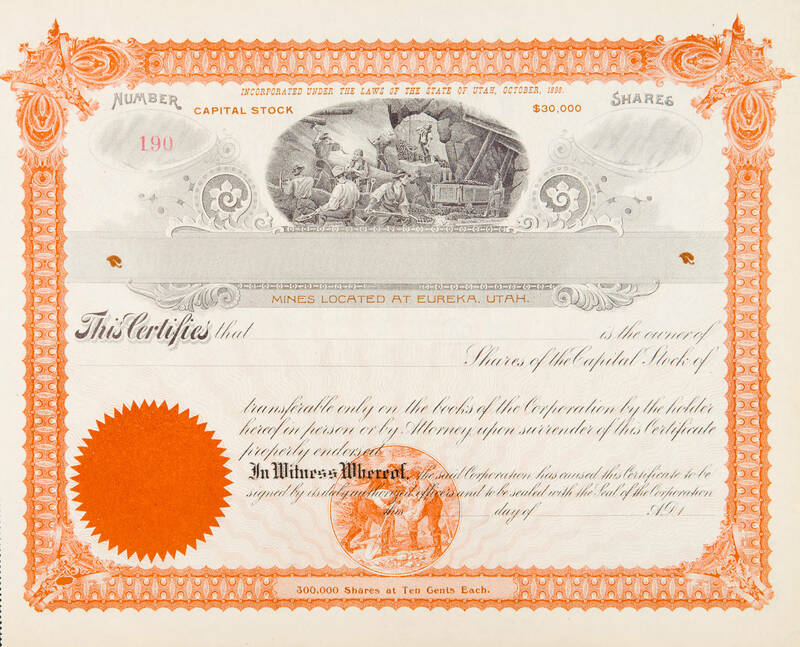 These funds are calculated to continue over the number of years which it is presumed the mines will live so that upon the cessation of mining, the owners of the stocks will have been completely reimbursed with their original outlay in addition to the dividends that have resulted from the success of the enterprise. It is here that the problem of the life of a mine enters into economics, and it is important that it be given its due share of study. Amortization is not of American origin and it has not been adopted in this country to the extent which it is bound to be in the future. One means of providing against an extinction of a mining company's activity with the exhaustion of the ore bodies in the mines is to provide new mining territory to which operations may be transferred at the proper time. This plan has been very successfully carried out by a number of large mining companies. When a mining company has been maintaining its identity for a considerable period, it has reached a very desirable stage of economy in the make-up of its various lists of officials, superintendents and engineers. All this efficiency can be very readily transferred to the operation of virgin mining property. Often much of the equipment of a mine can be moved and used again. When a mine is known to be nearing its finish, there is a hesitancy on the part of the owners in replenishing the equipment and sometimes the mining is kept up through the use of worn-out, inefficient apparatus when, were the owners expecting to continue mining, they would purchase and install the new equipment when it is needed. One company in the San Juan region of Colorado prepared for the contingency by purchasing neighboring property to which it moved its operations. Another large company bought a large piece of mining property in Mexico, although its initial operations were in Colorado. Placer mining companies frequently dismantle, move and re-erect dredges.